Happy Friday! It's time for Bloggers Challenge, and this week I gave the challenge players an easy theme - LOVE. A lot of times when I issue theme challenges, it's generally because I need to create that type of card. This week is no exception - DH and I are celebrating out 18th Wedding Anniversary on Monday. Gosh, where does the time go? I had created a card the other day, actually I've created a few - just not sure which one I'm going to give him yet. I wanted something a little more manly - didn't think flowers would go over to well! I used the Bombshell Sketch at Rubber Stamp Chat for my layout inspiration, rotating my sketch, and added the stamped leaves and acorns to fill the open space. I created my own DSP using the leaves from Kitchen Sink Stamps 3 Step Autumn Squirrel, and the Depth of Field Technique. It takes a bit longer to do this technique with Multi Step Stamps but I'm very happy with the outcome. I stamped the leaves as follows on White: #3 Sahara Sand, #2 Sahara Sand stamped off, #1 Sahara Sand stamped off; #3 Memento Tangelo, #2 Tangelo stamped off, #1 Tangelo stamped off; #3 Memento Rhubarb, #2 Rhubarb stamped off, #1 Rhubarb stamped off. I stamped a Tangelo and Rhubarb leaf on scrap White cut it out, sponged the edges, and added it to the Basic Grey panel with dimensionals. The Acorns were stamped as follows: #3 Close to Cocoa, #2 Old Olive stamped off, #1 Sahara Sand, then adhered to the leaves with dimensionals. I frayed a piece of hemp and added it with a Glue Dot. The sentiment is stamped in Close to Cocoa. 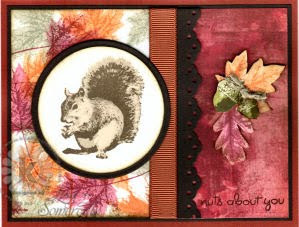 To create the Squirrel, I stamped #3 in Close to Cocoa, #2 Sahara Sand, #1 Memento Desert Sand on White card stock, then cut with the Spellbinders Circle Die, and layered onto a Chocolate Circle, adhered to my card with Dimensionals. Looking for more Love Themed inspiration - just click on the Bloggers Challenge Logo on my sidebar. Have a great weekend! Anniversary Congrats to you both! Beautiful card, lovin' that image and the background rocks! Super cute! Great colors! Lovin it! Happy Anniversary, love the little squirrels, a very fall-feeling card. What a beautiful anniversary card! The sentiment is just perfect! I personally think this is gorgeous and definitely shows that you created something special that took time. If he doesn't love it, send it my way! I adore this card! Oh my this is just fabulous. Love the way the background leaves look and that squirrel is just amazingly life like. - Happy Anniversary! Beautifully done, Lisa! Happy Anniversary to you guys - our 18th is this year too, in December! rock out, love the rich fall colors and the detail of each stamp..those are nice stamps. great job on making your own DSP. Great card, Lisa! I love this squirrel stamp and plan to use it on my Thanksgiving cards. Thanks for the inspiration, and happy anniversary! All I have to say is this is just too darn cute! Wowza! I LOVE this card! The depth of field tech is just GORGEOUS and those KS stamps are to die for! Love what you do with them! Happy anniversary to you and your husband, Lisa! This is a fun card for celebrating a fall anniversary. Happy Anniversary!!! The squirrel is so life like. The background technique is perfect for the season.